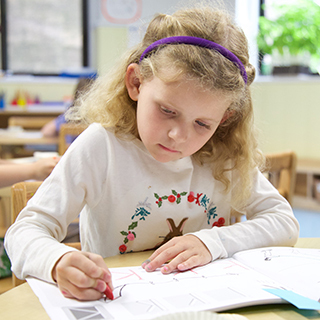 Grace Church School offers a nurturing environment for a child’s first school experience. We offer 3-day morning and afternoon programs for the Twos, as well as a 5-day morning program. Please see the Class Schedule for 2018–2019. In a thoughtful and individualized process, the Twos gently separate from their parents/caregivers. Prior to the first day of school, each child comes to the classroom for an individual visit accompanied by a parent. This provides an important opportunity for a child to meet his/her teacher and to freely explore the classroom without the presence of other children. Individual Visits also provide the opportunity for parents to chat with their child’s teachers. The first days of school begin with half groups on an abbreviated schedule. Gradually, the children become familiar with their teachers, their classroom environment and their peers as their days lengthen in time. In the classroom, both familiar and novel materials are available for children to explore. 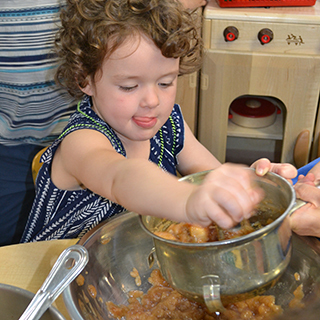 Activities include block building, sensory/art explorations, dramatic play with a variety of props, circle time, outdoor gross motor play and music and movement activities. Teachers with a special understanding of this age group facilitate cooperation and turn taking. They encourage the development of self-help skills, and in turn this leads to increased self-confidence. Most importantly, Twos teachers focus on creating a warm and trusting environment and helping each child grow at his or her own pace. There are three classes for this age group—a Morning Threes class, an Afternoon Threes class, and an Extended Day Threes class. Prior to the first day of school, every child, new or returning, comes for an individual school visit accompanied by a parent. Threes begin the school year with an abbreviated schedule in half-groups that supports children new to school and helps acclimate returning children to a new school year. At this age, with burgeoning social language skills, children become more interested in their peers. While two year olds often play alongside their peers, three year olds usually interact with their peers. In the Threes, children have a better understanding of what it means to be part of a group. Children participate in classroom jobs and develop a sense of responsibility as a community member. Studying themes that are relevant to their lives, Threes begin to develop greater self-awareness and an interest in learning about each other. Through open-ended and more structured activities, Threes learn early literacy and math concepts. Through play with their peers, children learn to take turns, disagree, and collaborate. Play is important for the development of empathy, and children playing together learn how to negotiate with the support of classroom teachers. They must choose and use their words carefully. They learn to express: “I need that” or “Can I have a turn?” Teachers encourage the children to ask questions, approach challenges and express their thoughts. This results in animated discussions and activities. Threes visit our music specialist and our movement specialist each week. They visit the library and spend part of each day on the roof playground, in the gym, or in the school garden. Pre-Kindergarteners attend school until 2:30 pm Monday through Thursday, and until 12:30 pm Friday. Pre-K is designed to provide the children with the optimal balance of structure, independence and nurturing as they build their social-emotional, fine and gross motor, and cognitive skills. Four and Five year olds build large block structures and use their growing imaginations as they role-play in the dramatic play area. They make classroom books, follow recipes to cook special snacks, and use a variety of art mediums to creatively express themselves. At Grace, we emphasize process over product. They express themselves in journals through drawings and dictate their own narration to accompany their illustrations. Curriculum arises from the children’s interests. Throughout the day literacy and math concepts are interwoven into their activities. Pre-Kindergarteners enjoy group activities and listening to the views of their classmates. Still impulsive, they are becoming increasingly able to consider actions and consequences. They share ideas, ask peers to join them in an activity, and begin to care more deeply about being included in the social group. Pre-K children begin to have a genuine sense of empathy. They can be wonderfully kind friends, yet they also have passionate disagreements! 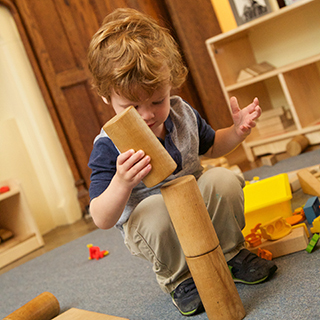 Pre-K teachers at Grace Church School understand that the children are figuring out how to navigate their increasingly sophisticated social world along with their rapidly growing cognitive abilities. They model respect and empathy and they create curriculum studies that relate to the children’s daily lives. By year’s end, the Pre-Kindergarteners are ready and eager for Kindergarten! In weekly classes with our movement specialist, children build spatial awareness, learn about team playing and hone their gross motor skills. They practice ball handling, games, basic motor skills, gymnastics and dance. Our goal is to promote the children’s self-confidence and joy in movement and lay the foundation for a lifelong interest in physical activity. The School’s music program seeks to inspire the love and joy of singing. Weekly classes for our children include a diverse repertoire of songs celebrating many cultures, daily life in our city, and various holidays and celebrations that occur during the school year. 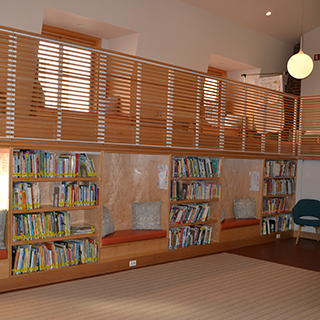 The award-winning Hope Library is a place set aside for the pure enjoyment of reading. It is sun-filled, cozy, and welcoming. The children’s weekly visits to the library include listening to carefully chosen stories, engaging in lively discussions and taking time to browse and curl up on a cushioned window seat with a good book. Teachers find books on varied topics to add to their classroom collections.